If you're one of those people who likes to cast your ballot at your neighborhood polling place, you might want to savor your experience at next Tuesday's general election. Beginning in 2020, Los Angeles County will shut down thousands of polling locations and replace them with voting centers that would stay open for more than a week. Back in 2016, the Golden State passed the California Voter's Choice Act to give voters more options for how, when and where to cast their ballots. Think of it as an effort to revamp an old model for 21st century lives. Sacramento County and a handful of other counties began making changes this year. 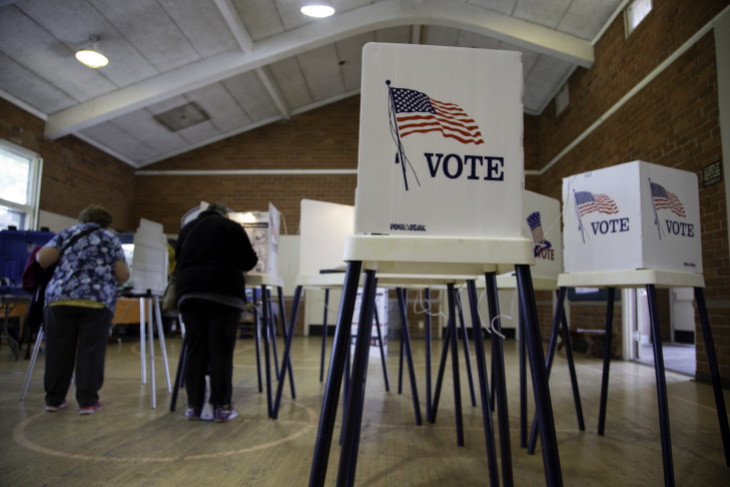 Los Angeles County's voting system will get a facelift, too, just in time for California's primary elections in March 2020. Many neighborhood polling places will be replaced by vote centers. Centers will be open for 11 days, and voters will be able to vote or drop off mail-in ballots at any center in L.A. County. If you misplace your ballot or forget to register to vote, workers can help you with that too. There will be drop boxes across the county where mail-in ballots can be deposited. HAVE OTHER ROLLOUTS BEEN SUCCESSFUL? For the most part, yes. There were a few awkward instances in Sacramento where drop off locations weren't open early enough for voters. At one library, frustrated voters stuffed their ballots under the door and peaced out. Yes, their votes were still counted. You're not alone. Mindy Romero, director of USC's California Civic Engagement Project told LAist that surveys conducted in 2017, ahead of the five-county rollout, revealed communities of color were especially wary. "Because the change was so significant, it made them wonder why the significant change was happening and could they trust it," she said. It's a concern echoed by Luis Sanchez with Power California, a group that mobilizes young people and communities of color to vote. "Yeah, I think we need to put it in context of the Trump Administration, right?" Sanchez said. "You hear the conversation on the national TV. It says like, well, they're trying to take our right to vote away in Texas and Georgia — is that happening in California?" Voters could also become confused if their polling place changes. "Because if you've actually changed the polling location for someone who's been voting for 10, 20 years, and all of a sudden they show up and that's not the place they have to vote, will they actually find the new polling location or voting center?" he asks. Sanchez is hoping that L.A. County will work with groups like his to get the word out about the changes. The rollout will be preceded by community outreach. Logan said the county has already hosted community meetings and completed analysis with community organizations on the best places to put vote centers. "That's the meat of the work that's being done now so that when we're ready to implement in 2020, we feel confident that we're well covered," he said. If you'd like to make a suggestion, you can do it here. To learn more about upcoming changes, check out the Secretary of State's website here.